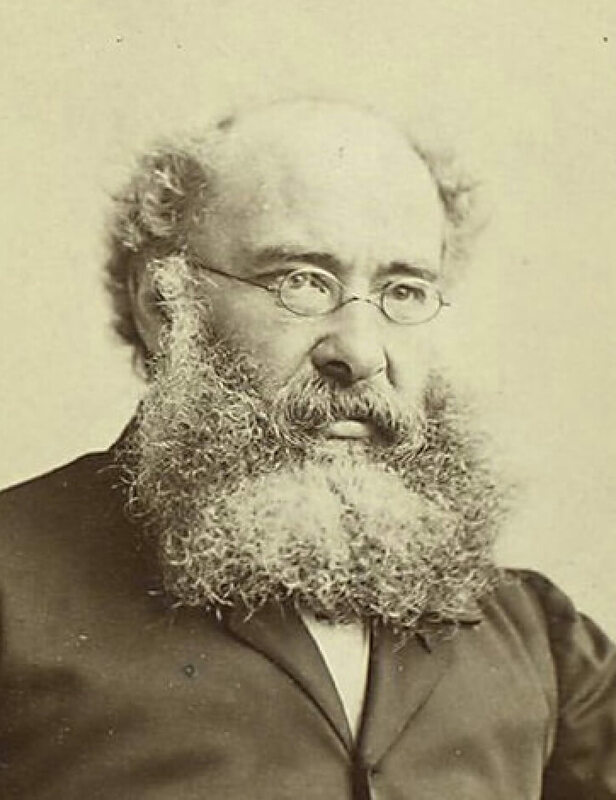 Anthony Trollope (1815 - 1882) was an English author and postal worker, best known for his serial novels, Chronicles of Barsetshire , of which, The Warden is the first and the best. In addition to writing about this imaginary county, Trollope published novels dealing with politics and gender issues. His novel, The Fixed Period is featured in our collection of Dystopian Stories. Trollope had a miserable childhood, the offspring of parents of privilege who squandered their wealth, his father failed at law and as a farmer, but wanted his children to regain social status and wealth. They sent Trollope to elite schools where he was bullied, had no money, and no friends. Though he contemplated suicide, Trollope focused on inventing imaginary worlds, which spawned his later writing career. Because of their family's debts, the Trollopes fled to Belgium to avoid being prosecuted, where Trollope was offered a commission in an Austrian cavalry regiment. Before he could be accepted, he needed to learn French and German, so he took a job as assistant master of a boy's school in Brussels to pay for his language classes. He lasted a mere six weeks there, before quitting teaching in favor of joining the cavalry. Instead, he accepted a postal surveyor clerk position in Ireland in 1841 to escape his problems with new scenery. Trollope enjoyed meeting Irish country people, as published in his biography, Trollope (1883): "The Irish people did not murder me, nor did they even break my head. I soon found them to be good-humoured, clever—the working classes very much more intelligent than those of England—economical and hospitable." Trollope returned to England in 1851, where he was charged with restructuring the rural postal delivery routes in Southwest England and South Wales. He traveled for two years, mostly on horseback, and said this was one of the happiest periods of his life. This is when Trollope conceived the plot of The Warden (1855), which was the first of the six Barsetshire series novels. The work got him noticed by the critics and the novel-reading public, and he earned enough money to dedicate his career to writing, though, he continued working for the Post Office. He accepted a position as a surveyor for England's eastern district (Essex, Suffolk) in 1859. You could say Trollope remained "a man of letters." We offer several of Trollope's short stories we hope you enjoy.